The goal of spirituality is not merely about the salvation of the soul; it is also about the enlightenment and liberation of the mind. There are many levels of existence, both subtle and physical, each containing unique expressions of the Divine. As such, it is our duty as spiritual seekers to learn as much as we can about these intermediate levels in order to better understand the fullness of God. While faith is essential to spirituality, it should never be given blindly. Therefore, we encourage congregants to become educated about the historical truths of the Bible, the church, and Christ. Truth can be found within all of the world's religions, and can be uncovered through study, introspection, and discernment. As such, we do not discriminate against any nation or creed, knowing that we are all equal in the eyes of God. Spiritual illumination can be achieved through a mindful life of prayer, study, inward meditation, and the rigors of maintaining a decent, ethical life. The deep, transformative understanding of wholeness associated with personal, spiritual experiences of God, are essential to creating global and societal change. Spirituality is ultimately personal, and therefore, must be dicovered by the individual. As such, we do not recognize any member of the church as having a special, divine authority greater than anyone else. Mankind can never truly define or limit spiritual expression or evolution, as the fullness of God can never be fully understood my finite minds. Therefore, spiritual belief and expression should be adaptive to the changes of understanding, or Gnosis, of God, rather than based solely on dogmatic teachings. Balance in all things is to be cultivated and integrated, be it intellect and emotion, masculine and feminine, or faith and science, as all are aspects of the Divine. 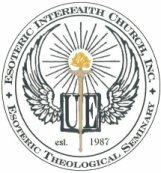 Copyright © 2009 - 2011 The Esoteric Interfaith Church, Inc.